We're back to our weekly look at finance issues after our Christmas break. Before Christmas we were talking about refunds and exchanges. This week we're discussing the new credit card regulations that are coming into force from 13th January 2018. How many times have you gone through a process of buying or booking something on the internet only to come to the payment screen and find there extra fees to pay? Some companies not only pass on any payment fees from the credit card companies but also add extra on top to make a profit out of it. From 13th January 2018 this will change as the EU Payment Services Directive comes into force. As of then all surcharges on payment methods will be banned. It will also become part of UK law so will still be applicable after Brexit is finally completed. This will apply to all forms of payment from credit and debit cards to electronic payments such as PayPal, Apple Pay and Android Pay. It will also be applicable for all payments whether you pay online, over the phone, by mail order or in person. However many retailers are now looking at how they can bring in 'administration' or transaction charges in the place of the credit card fee. By stipulating a flat fee for all transactions regardless of how you pay would be a sneaky but legal way of going about it. The takeaway and delivery service Just Eat have already decided to add a 50p service charge to all payments including cash. In some circumstances a company or business could find that an alternative service charge would not be acceptable. In these cases future payments by credit card will no longer be allowed. One of these affected is tax payments for HMRC. Up to 13th January 2018 you can pay your tax bill by credit card but you will incur a fee to do so. From 13th January personal credit cards will no longer be allowed but corporate credit cards will still be. As this comes into force on 13th January and this year's deadline is 31st January for self-assessment filing and payment a lot of people could be in for a shock. If you don't pay on time you will incur interest payments and possibly penalties. You will also find that HMRC won't accept credit card payments for other forms of tax such as stamp duty, VAT and corporation tax. Other government departments and agencies will continue to accept credit cards. The DVLA have decided to drop the current £2.50 fee for paying by credit card. 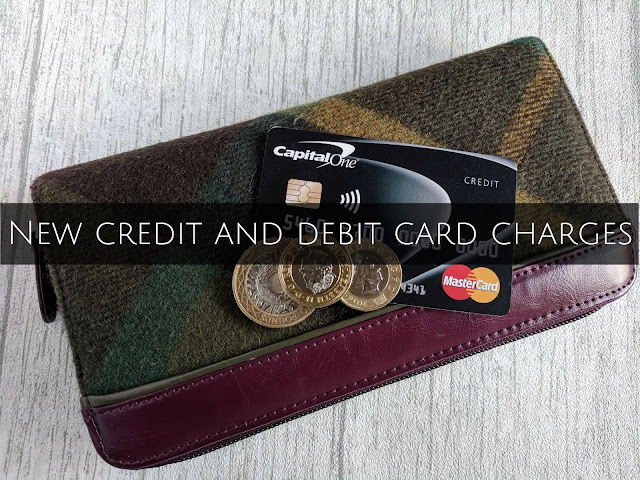 Have you been charged fees by paying by credit card? Has it made you use an alternative payment method? If you want to join in with this week's Finance Fridays then add your link to the linky below. Any post concerning financial matters is allowed. Full details here. It doesn't have to be published today as you have until 23.55 on Tuesday 9th January 2018 to join in.